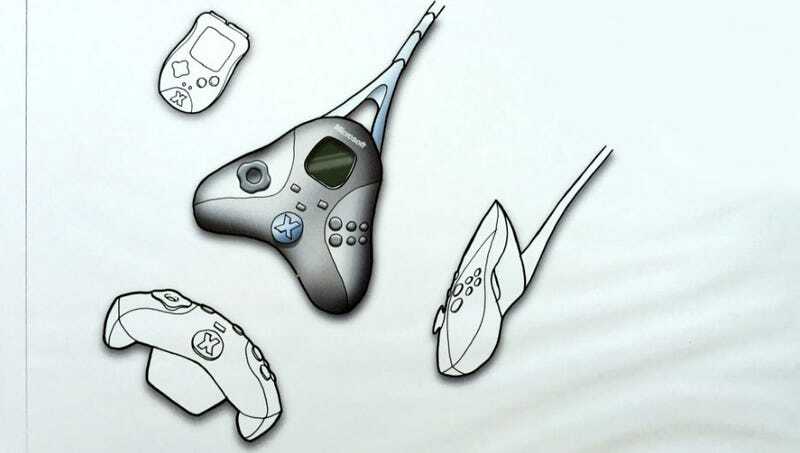 Seamus Blackley, one of the key people involved in the creation of the original Xbox, has shared some concept images for Microsoft’s debut control pad, which date all the way back in November 1999 (the Xbox wouldn’t launch until 2001). Obviously the final design looked remarkably different; the “Duke” controller (below, left) was a massive, hulking thing, and its replacement, the S Pad (below, right), laid down the template that Microsoft’s controllers still follow to this day. These prototypes, though, were wild, a direct representation of how close Microsoft and Sega were at the time. Any one of them looks like an after-market Dreamcast controller, not something designed from the ground-up for a new company’s first console. Blackley shared four images in all (via Gamasutra), each depicting the same VMU (Visual Memory Unit) design that the Dreamcast used (and which Microsoft kinda ended up borrowing with the Xbox controller’s memory card slot).